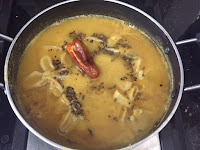 Dal ka Dulha is such an interesting recipe from UP and Bihar. 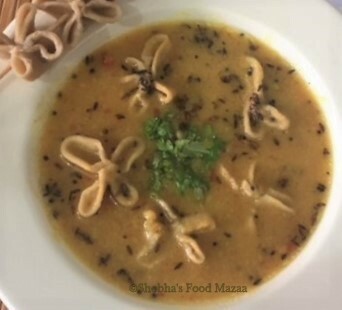 I was really fascinated when I saw this in the show Northern Flavours- Doosra Tadka by Chef Ajay Chopra. 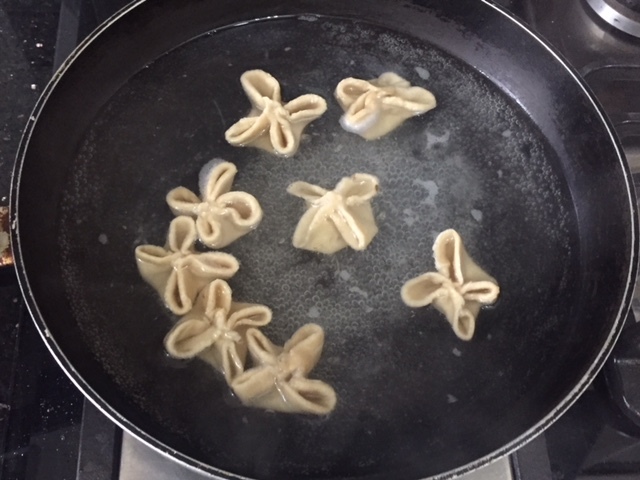 Small flower shaped dumplings made with wheat flour are cooked with lentils. It makes a complete meal on its own. 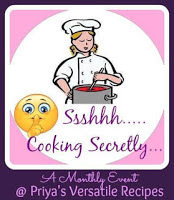 This month our group Shhhhh Cooking Secretly is doing the Bihar Cuisine. My partner of the month is Aruna Panangipally who blogs at - Aharam Do visit her space and check out her delicious recipes. Aruna gave me whole wheat flour and cumin seeds as the 2 secret ingredients and I got the opportunity to make Dal ka Dulha. Soak dal for couple of hours. 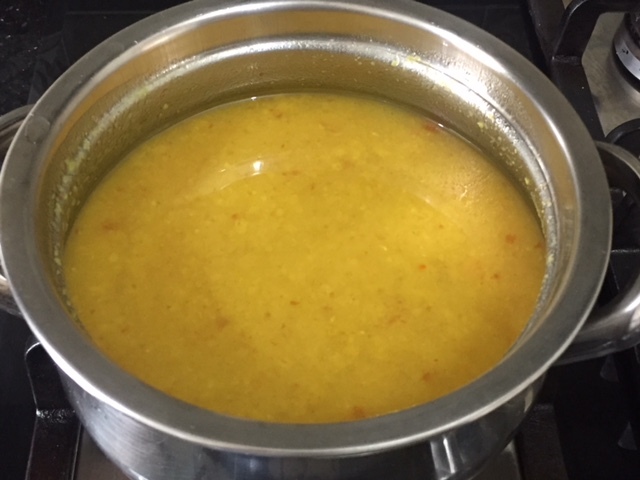 Cook it in a pressure cooker with 3 cups of water, tomato and a little turmeric powder. 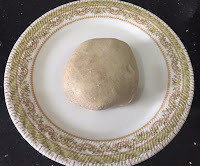 Knead the wheat flour adding the carom seeds, salt and enough water to make a soft dough. 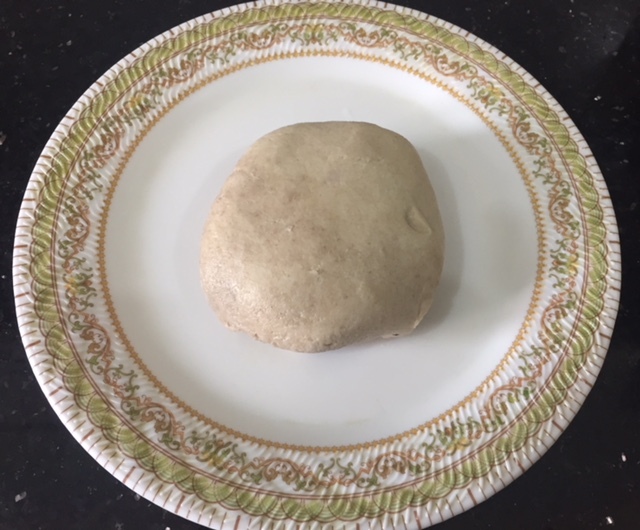 Take a small portion of the dough and roll out a chapati. Using a cutter or a lid cut out roundels. 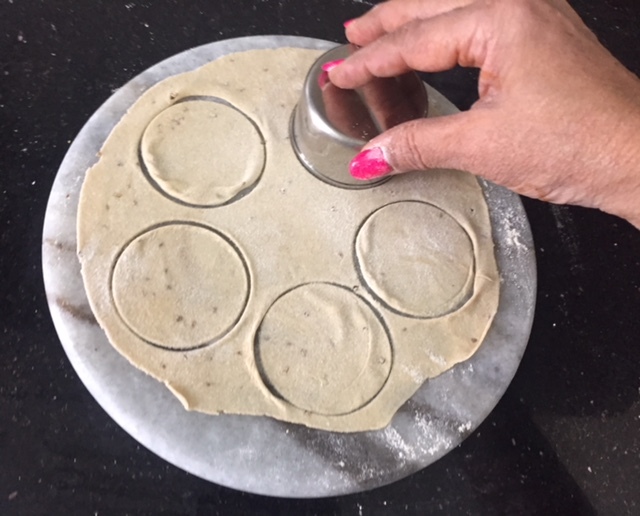 Take each roundel and using finger tips join the two edges and pinch lightly so that they don't open up while cooking. Now do the same with other two edges to make it like a small flower like dumpling. Repeat with the remaining dough. Heat water in a pan and boil the dumplings for about 5 minutes. 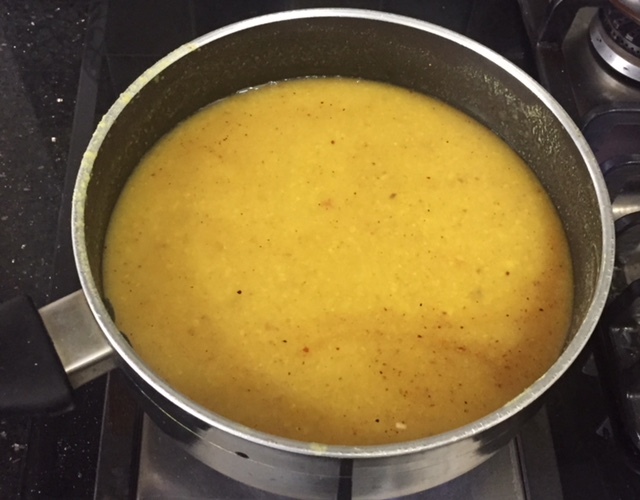 Now dilute the boiled dal adding some water and tamarind juice. Check the salt and add if required. 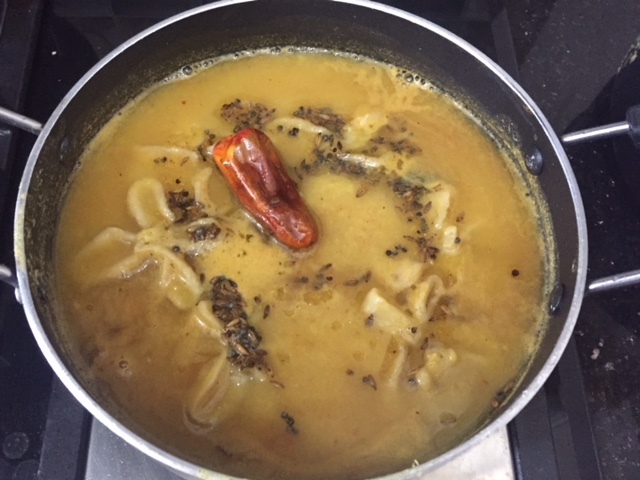 Tip in the dumplings into the boiling dal. Reduce the flame and simmer to cook them further until edible. Maintain the consistency of dal as you like it and add water accordingly. Heat oil in a small pan and add the tempering ingredients. Garnish with a little tempering and coriander leaves in individual serving plates. 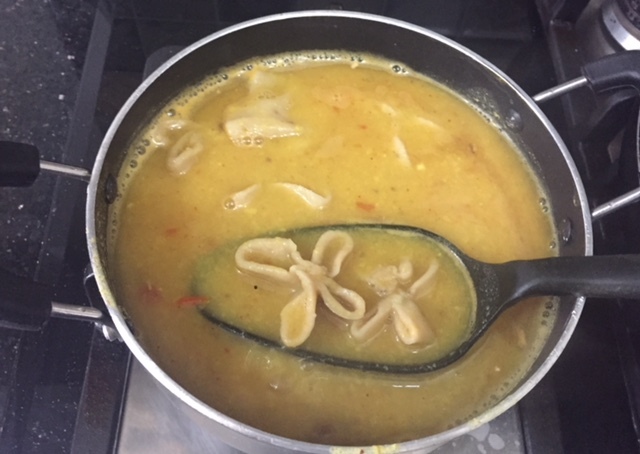 Tried it at home.....a Bihari version of saal dhokli.....pls post more recipes from the region. Thanks for liking .. Will surely post soon. I loved the perfect flower shapes you made. Indeed, we eat with our eyes first. This recipe is quite like the Dal Dhokla I love; will try it soon. So true Aruna.. we get attracted to well plated dishes. Thanks for the compliment Nisa. The dish looks perfect... beautifully done ! How pretty those Dulha looks, dal ka dulha looks very delicious and nutritious. oh wow.. loved those cute flowers.. yumm dal and lovely presentation ! This looks so beautiful, it would be a sin to eat it! Awesome share! Lol Priya.. Yes when a dish looks pretty you have that feeling of admiration for it. I learnt something new!Wonderful recipe and brilliant photography! Those flowers definitely look so so cute. A bit like dal dokhri but am sure the taste must be so different. Thanks Mayuri.. yes this dish is quite similar to dal dokri. 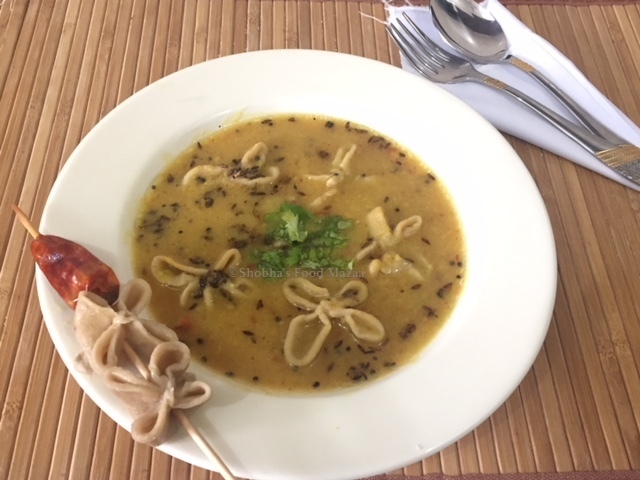 Yes Jolly.. it is a kind of decorative dal dhokli..
Love seeing recipes from different regions and I am happy to add another dal recipe to my repertoire! Looks so lovely! I've heard about this dish, but have never tried it yet, hope to make some soon :) Bookmarking this! What an interesting name , I too have seen this episod of chef Ajay Chopra, loved the way you have executed the dish. 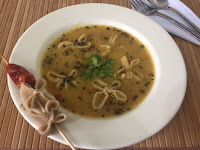 Dal ka dulha, interesting name and seems flavourful. Small flowers looks so cute. Wholesome and comfort meal. The very name got me curious to read your entire post. Daal with dumplings - that's a complete meal on it's own! Will definitely try this uber delicious and super interesting recipe very soon. Thanks for liking Maria.. make and enjoy.. Such a healthy dish that is, similar to Gujarati Daal Dhokli! Yes Jagruti.. just the shape is different.. This looks so delicious, love those florets which you have dunked in. Do wanna try it sometime. Thanks dear.. they look cute indeed. Ok.. they also make that way in Gujarat. Looks delicious and very beautiful. Would love to try soon. Thanks .. do make and share the feed back. Yes Sapana.. it is a tasty meal and light too. Thanks Lathi .. Must try it dear. Even i had seen it on TV and it really caught my attention. Would definitely like to try your version. I love the name of this dish. It looks so delicious. Bookmarking it.Beautifully presented.